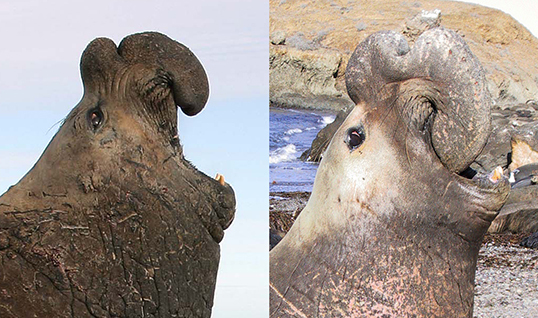 The most amazing fact about elephant seals is the huge difference in size and morphology between males and females. Males may weight up to four tons while maximum recorded weight for females is around 900 kg, and the most of them are lighter. Males are provided by proboscis, enlarged canine teeth and a stiff dermal shield in the chest. All those traits area likely the result of evolution by sexual selection: larger males may be more effective in fighting and in achieving control of females, larger canine teeth could be used to give deeper bites, and the dermal shield could be able to protect from them. Moreover, females may prefer to mate with males with larger proboscis. 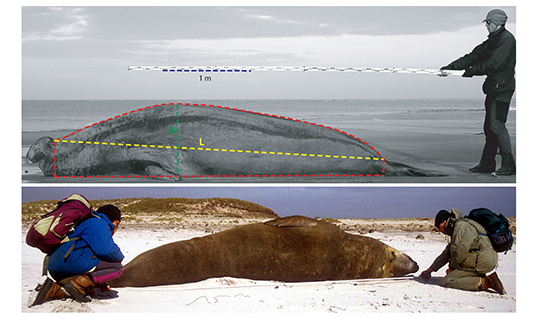 The most difficult problem when studying elephant seals is that they are so big that direct weighing and measurement of adults is not practical. 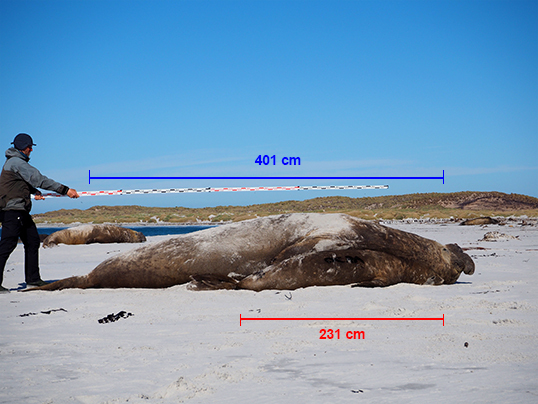 Therefore, we used indirect photogrammetric methods to measure body size and length, by taking photos of the animal with a calibrated surveying pole in the frame, and then measuring the photos using the pole as a scale. That way, we are able to achieve a good precision in measurement without any direct manipulation of the animal. The area of the side outline as measured from pictures is a very good indicator of weight. 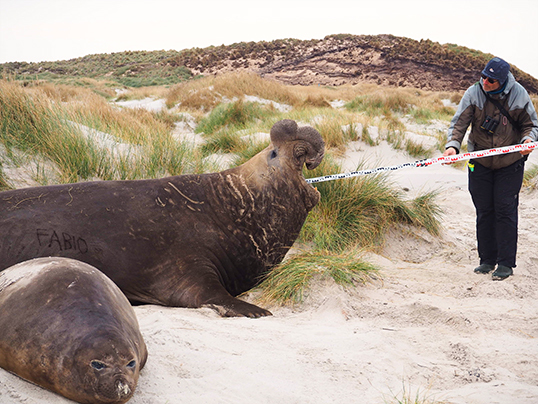 With this procedure an estimate of weight may be derived also for the largest males, which, on Sea Lion Island, may be over 4 tons. We verify accuracy of these measurements by taking direct measures with tape and by calculating repeatability indices of photographic measures. The most puzzling secondary sexual trait of the males is definitely the trunk or proboscis. A peculiar problem of studying the proboscis is that it should be measured while inflated and with the animal behaving naturally to provide meaningful data. To study the proboscis we used the same photogrammetric method described above. An operator kept a one meter long referencepole in front of the male, while another operator took photos or videos. We then measured the proboscis in photos or video frames using the reference pole as a scale. 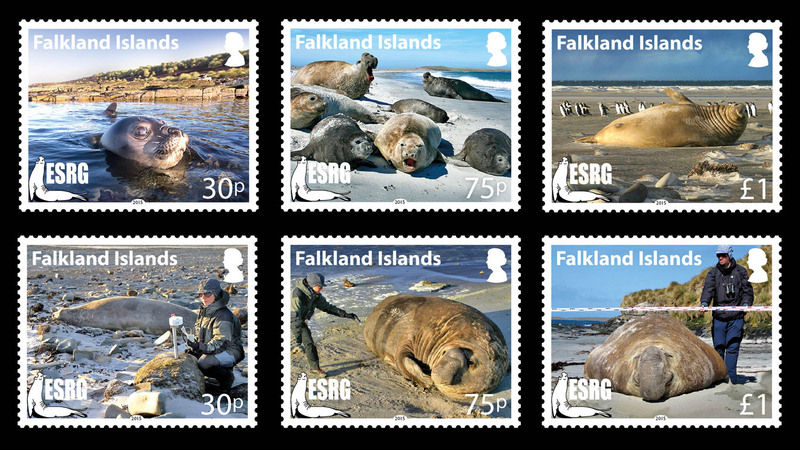 Using the photogrammetric approach with breeding females proved to be more difficult than with males. Although is definitely possible to obtain photos of females with the poole scale, females are smaller and more watchful than males, and, therefore, are more difficult to be approached undetected from the rear. Moreover, females spent most time on land inside harems, and core females, that are inside the harem, are in fact unaccesible. Therefore, we devised a new measurement method based on simple trigonometry that requires just the mesurement of distances and angles. We measured distances using a laser rangefinder (the Leica Disto) and angles using a digital protractor. 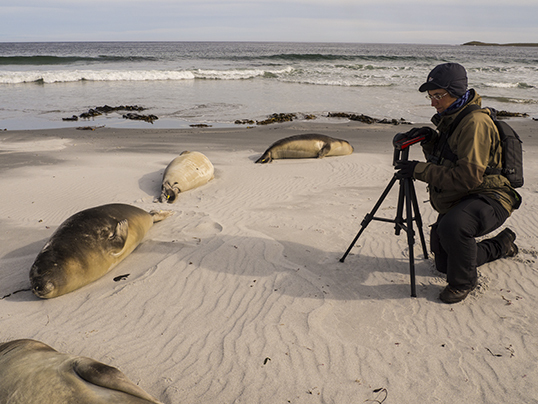 The system is mounted on a tripod and permits to accurately measure seal size from the distance without any need to approach them. Recently, we acquired a new laser rangfinder (the Leica Disto S910) that has a high accurary digital compass and, therefore, permits to measure not only distances, but also angles (without the external protractor), and can calculate the size of the seals directly. 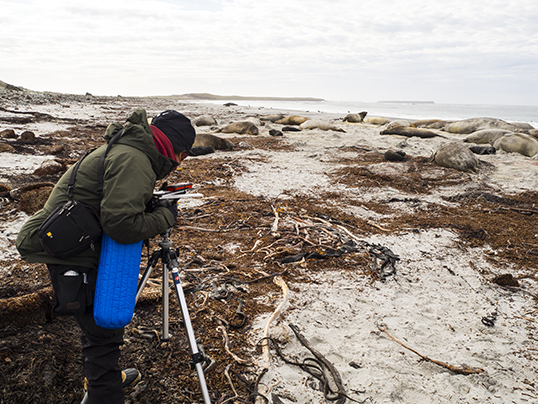 A preliminary test of this new unit was extremely successful, it permitted to measure a large number of seals, including weaned pups and moulting seals, in a short time.